Hurricane Florence, a Category 4 storm, is headed right for the Carolinas. At least a million people are under orders to evacuate their homes. (RNN) - The National Hurricane Center issued hurricane warnings for the Carolinas on Tuesday as millions braced for the strongest storm to hit the region in decades. After weakening earlier in the day, Hurricane Florence regained its punch as evening approached. “Further strengthening is forecast tonight and Wednesday,” the NHC said Tuesday. Washington, DC, Mayor Muriel Bowser joined the governors of North Carolina, South Carolina, Virginia and Maryland in declaring states of emergency. More than 1 million people have been ordered to evacuate as the storm advances. Evacuation orders for low-lying areas were issued Monday and continued Tuesday. Many major roads and arteries have reversed traffic flow to help those evacuate quickly. At 2 a.m. 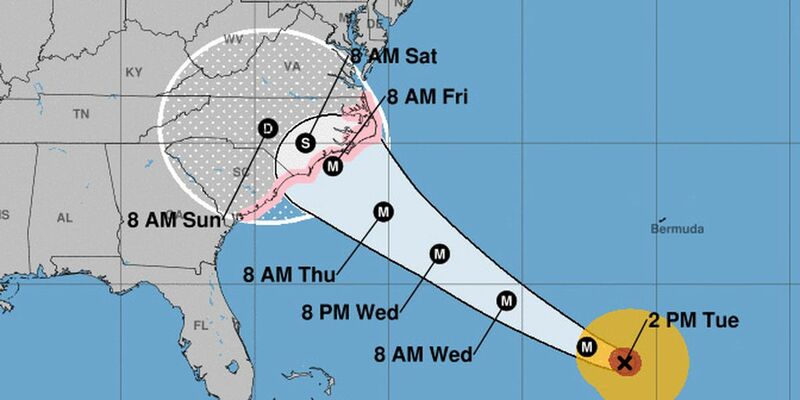 ET, Hurricane Florence was 625 miles southeast of Cape Fear, NC, packing maximum-sustained winds of 140 mph and moving to the west-northwest at 17 mph, the National Hurricane Center in Miami reported. Hurricane-force winds now extend up to 60 miles from the eye of the storm, and tropical-storm-force winds now extend up to 175 miles from the center of the storm. Florence could be the most powerful storm to hit the Carolinas since Hurricane Hazel in 1954, which came ashore at the border with North and South Carolina, killing 19 people in North Carolina and causing catastrophic damage along the coast. A storm surge warning has been issued from South Santee River, SC, to Duck, NC, and the Albemarle and Pamlico Sounds. A hurricane watch is in effect for Edisto Beach, SC, to South Santee River, SC, and for north of Duck, NC, to the North Carolina/Virginia border. "A storm surge warning means there is a danger of life-threatening inundation, from rising water moving inland from the coastline, during the next 36 hours in the indicated locations," the hurricane center advisory said. “A storm surge watch means there is a possibility of life-threatening inundation, from rising water moving inland from the coastline, in the indicated locations during the next 48 hours,” the NHC said. Expected to make landfall by early morning Friday, most likely along the coast of North Carolina, the impact of the Category 4 storm will be widespread, with destructive winds, life-threatening storm surge, dangerous surf, torrential rainfall, flooding and the potential for tornadoes. Florence will bring large rainfall totals through Saturday in North Carolina, north South Carolina and Virginia, from 15 to 25 inches, with isolated spots that may receive 35 inches, causing life-threatening flash flooding. The impact of storm surge on the coast will depend on whether the storm’s arrival coincides with high tide. Areas along the coast from Cape Fear to Cape Lookout, NC, including The Neuse and Pamlico River, may experience storm surge from 9 to 13 feet. A number of major airlines issued travel advisories for areas expected to be hit by Florence, including American, Delta, Southwest, Spirit and United, CNN reported. Forecasters expect the storm to linger over the Carolinas once it makes landfall, dumping rain, National Hurricane Center Director Ken Graham told the Associated Press. The hurricane will also bring large swells to the U.S. coast and Bermuda. The Atlantic and Pacific basin has become very active recently, with the weather map dotted with tropical disturbances. Hawaii is bracing for Tropical Storm Olivia, which could reach the Pacific island by Wednesday, KHNL reported. Portions of the island state are under a tropical storm warning ahead of the storm's impacts. The governor of Hawaii, David Ige, has declared a state of emergency ahead of the storm, the impacts of which will begin to be felt Tuesday night. In the Atlantic basin, forecasters have issued tropical storm warnings for Martinique, Dominica and Guadeloupe ahead of Tropical Storm Isaac. Hurricane Helene, heading north in the Atlantic, isn't expected to cause the U.S. any issues, the NHC said. And that’s not all. Two disturbances - one in the Caribbean and one well out in the Atlantic - stand moderate changes of developing into tropical storms, forecasters said.